Spring showers lead to spring flowers in the Clear Fork Valley. But they can also lead to flooding as rain falls on already saturated ground. 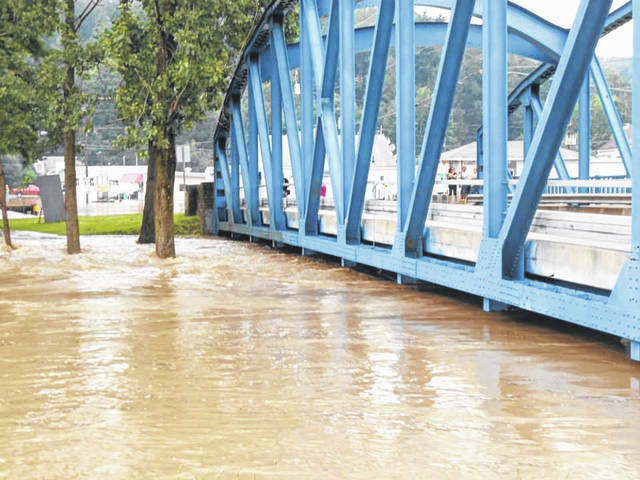 This photo is of high water under the bridge in 2015. Residents of areas prone to high water need to be vigilant this time of year. BELLVILLE — Rain is expected again this weekend in the Clear Fork Valley. In fact the long-range forecast — as of Tuesday — is predicting at least a 40-percent chance of rain almost daily through the first week of April. But that’s not unusual for this time of year in Ohio. Still, it’s a good time to think about spring weather safety. Richland Public Health is a NOAA Weather-Ready Nation Ambassador. These tips are courtesy Richland Public Health, and more information is available on the Richland Public Health website. Flood Advisory — Be Aware: A Flood Advisory is issued when a specific weather event that is forecast to occur may become a nuisance. A Flood Advisory is issued when flooding is not expected to be bad enough to issue a warning. However, it may cause significant inconvenience, and if caution is not exercised, it could lead to situations that may threaten life and/or property. Flood Warning — Take Action:A Flood Warning is issued when the hazardous weather event is imminent or already happening. A Flood Warning is issued when flooding is imminent or occurring. Flash Flood Warning — Take Action: A Flash Flood Warning is issued when a flash flood is imminent or occurring. If you are in a flood prone area move immediately to high ground. A flash flood is a sudden violent flood that can take from minutes to hours to develop. It is even possible to experience a flash flood in areas not immediately receiving rain. During a flood, water levels and the rate the water is flowing can quickly change. Remain aware and monitor local radio and television outlets. Avoid flood waters at all costs and evacuate immediately when water starts to rise. Don’t wait until it’s too late! Stay Informed: Monitor local radio and television (including NOAA Weather Radio), internet and social media for information and updates. Get to Higher Ground: Get out of areas subject to flooding and get to higher ground immediately . Obey Evacuation Orders: If told to evacuate, do so immediately. Be sure to lock your home as you leave. If you have time, disconnect utilities and appliances. Practice Electrical Safety: Don’t go into a basement, or any room, if water covers the electrical outlets or if cords are submerged. If you see sparks or hear buzzing, crackling, snapping or popping noises —get out! Stay out of water that may have electricity in it! Avoid Flood waters: Do not walk through flood waters. It only takes six inches of moving water to knock you off your feet. If you are trapped by moving water, move to the highest possible point and call 911 for help. Do Not Drive into flooded roadways or around a barricade: Turn Around, Don’t Drown! Water may be deeper than it appears and can hide many hazards (i.e. sharp objects, washed out road surfaces, electrical wires, chemicals, etc). A vehicle caught in swiftly moving water can be swept away in a matter of seconds. Twelve inches of water can float a car or small SUV and 18 inches of water can carry away large vehicles. Be Weather-Ready: Check the forecast regularly to see if you’re at risk for severe weather. Listen to local news or a NOAA Weather Radio to stay informed about severe thunderstorm watches and warnings. Sign Up for Notifications: Know how your community sends warning. Some communities have outdoor sirens. Others depend on media and smart phones to alert residents to severe storms.